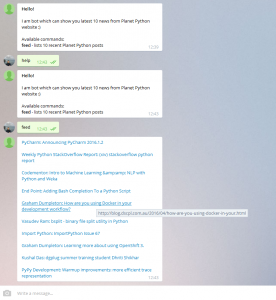 This is the second part of my small tutorial about creating a Telegram bot using Python and Django. Today I am going to show you how to deploy our Django app on Digital Ocean VPS hosting, we are going to use Linux Ubuntu 14.04 LTS version. Even despite we are going to work with Django app, this instruction will be applicable for any Python WSGI web application, so do not hesitate to use it with Pyramid, Flask, Bottle or any other popular web application framework in Python ecosystem. In this post I am going to use VPS (Virtual Private Server) on popular Digital Ocean hosting. By the way, if you sign up using my link, you will get $10 credit instantly on your account, money can be used to buy small servers and use them for your own purposes. Moreover, it is not neccessary to deploy your app on public servers, everything can be performed on your local ubuntu machine or with admin tools like VirtualBox or Vagrant (but in this case you will not be able to set up a webhook). Let's get started. I assume that you already signed up on Digital Ocean. So, log in and then press Create Droplet at the very top. Now we are going to choose the cheapest droplet for our purpose ($5 per month). Select Ubuntu 14.04.5 LTS or the newest one. Scroll down and choose a data center. Usually I prefer Frankfunt due to lowest ping rate from my place. When everything is ready, press Create button. Your droplet (VPS) is going to be ready within 60 seconds, you will find remote access credentials on your mailbox. When server is ready, you have to log in and change your root password. And then create a sudo user. When sudo user has been added, log in under this user called django. Let's now install packages that we are going to use for deployment. At the very beginning I have mentioned that we are going to use pyenv to install the latest Python version (I usually do not work with system python when it comes to custom scripts and web apps). If you do not know what is Pyenv and how to work with it, take a look at my post in Russian (will translate it ASAP). It takes some time to download, compile and install newest version of Python, please be patient :) Ubuntu 14.04 has Python 2.7.6 which is quite old and has some security problems with TLS and it does not support TLS 1.2. Now we have to clone a repo. If you forgot the link, here it is. Configure isolated python virtual environment using pyenv. It is time to install dependencies using pip. I have made some changes which are not covered in the previous post about Telegram bot. I moved some variable settings to .env file which is controlled by a reusable django app called django-envrion. Take a look at the changes. Create .env file from .env-template file and then you have to provide your own credentials. You have to change DEBUG to False, put your Telegram bot token and provide additional hostname (if you have several host, they should be separated by comma). Example shows that I have 2 hosts: loopback and additional subdomain host for telegram bot (which is going to be used to set up a web hook). Moreover, if you decide to use a webhook, you have to obtain a valid SSL certificate or create your own self-signed certificate using tools like OpenSSL. We are going to obtain a valid one using free service called Let's Encrypt. I have a Russian article which describes the process of issuing SSL certificate (will translate ASAP). You have to answer some questions regarding a website and when everything is ready, your fresh certificate will be located at /etc/letsencrypt/live/bot.khashtamov.com/. Pay attention to "-d" option in letsencrypt-auto script, put your own domain name. Do not forget to replace a hostname! Now we have to restart a server. Provide additional HTTP headers (IP address, hostname, http schema etc.). If you want to know more, take a look at docs. URL Not found error is OK because we only have 1 valid URL for our bot to receive commands (and django admin url of course). Now let's set up our production-ready WSGI server gunicorn which is going to be controlled by process manager supervisord. Supervisor is a process manager utility. It monitors processes and makes sure they work correctly. For example, if our gunicorn server dies supervisor tries to restart it and provides feedback. Pay attention that if you want to control a process via supervisor, make sure that your program is running in foreground mode. Save it as gunicorn.conf. We have already installed gunicorn via pip (it is our dependency in requirements.txt). If your settings are correct, there should be no error messages. Supervisor is controlled by supervisorctl utility. If supervisor is running, your telegram bot is already online. What will happen if your VPS is restarted (failure inside data center, system update, admin error etc)? Nothing. Your web apps will not be restarted. We have to fix it. We are going to use upstart init script. description "Supervisor Telegram bot django app starting handler"
So now your bot should receive messages and process them correctly.